Matt's eye was caught by the recipe for Buttermilk Biscuits with Green Onion, Black Pepper & Sea Salt in the new issue of Bon Appétit. "How good does this sound?" he asked. I wondered which of my upcoming meals he thought they would go with. His response was maybe chili since the biscuits had cornmeal in them or perhaps for a breakfast sandwich. 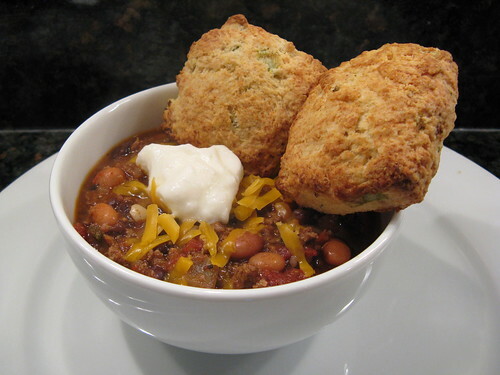 I liked the idea of making biscuits with chili but I wanted to add cheddar cheese to them too. In a small bowl mix together the buttermilk, onions & cheddar. Set aside. In a medium bowl whisk together the flour, baking powder salt & cornmeal. Add the butter. Use your hands to work the flour & butter together until it is the consistency of a coarse meal. Stir in the buttermilk mixture until large clumps form. Knead the dough about 3 or 4 times to bring everything together. Put the dough on a baking sheet covered with a silicone mat or parchment paper. Form into a square about 3/4 inch thick. 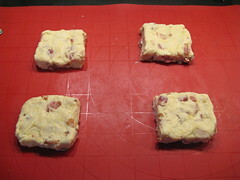 Cut the square into 4 pieces. Space the pieces about 2 inches apart. Melt a little more butter & brush it on the top of each biscuit. Bake for 15 minutes or until biscuits are golden brown. These biscuits were perfect with the chili & a nice switch from crackers or bread. We both really liked the texture & flavor of the green onions in them. Matt was a little iffy about the cornmeal, thinking it added some harder bits to the biscuits, I didn't really notice that. Then we started talking about all the different things you could flavor a biscuit with. I got the idea of a breakfast biscuit with bacon in it & that was all I could think of so I had to make it for breakfast the next morning. Think about it bacon, butter, cheese...a little piece of heaven on a plate. We had them on the side but they would be perfect as part of a breakfast sandwich. In a small bowl mix together the buttermilk, bacon & cheddar. Set aside. In a medium bowl whisk together the flour, baking powder, salt & sugar. Add the butter. Use your hands to work the flour & butter together until it is the consistency of a coarse meal. Stir in the buttermilk mixture until large clumps form. Knead the dough about 3 or 4 times to bring everything together. Put the dough on a baking sheet covered with a silicone mat or parchment paper. Form into a square about 3/4 inch thick. Cut the square into 4 pieces. Space the pieces about 2 inches apart. Melt some more butter & brush the top of each biscuit with it. I have been dying for chili all week. Its on the menu today! And so funny I was thinking some cornbread but then I'm thinking, nah, not in the mood. Then I visit you and you have the perfect accompaniement for my chili today. Love it Kat! That's a good name for a blog! 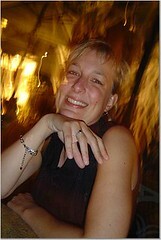 Lori - I love it when that happens! Gorgeous! And they sound so tasty. 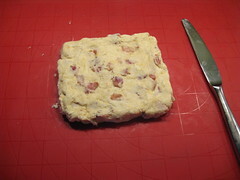 I love adding wonderful little bits to biscuits - ham and cheese is a favorite here. Yours look PERFECT! I bet they were wonderful. Niiice, you got me hungry right after finishing din-din. Cheddar and bacon, a wonderful union. Well I made them and I posted about them. They were SOOOOOOOOOOOO good! They mopped up chili quite well. Everything's better with bacon! Those biscuits look great! I happened to catch two cooking shows this week where the chef made a white chili... I can't really understand the point of a white chili personally, for me chili should be dark red with meat and beans like yours. The bacon cheddar biscuits look amazing--- I think I will make them for Zach next time I need to bribe him to do a project around the house. The bacon and cheddar look like the perfect addition to these. 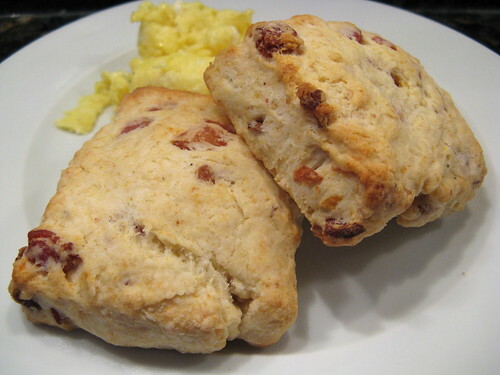 Biscuits with bacon? Count me in!! They both sound wonderful! I am totally biscuit challenged ~ I think I'll give these a try!